Time to breathe a sigh of relief, because it's the final Spy Fiction Fortnight post. Huzzah! It's been a reasonably successful few weeks, I think: certainly the essay on Le Carré's Tinker, Tailor, Soldier, Spy went down very well, racing away from the rest of the field to become the most popular post of the fortnight, not to mention the fifth most popular post of the past month (at time of writing); and honourable mention must also go to this post on Joseph Hone's The Private Sector and this one on Graham and Hugh Greene's The Spy's Bedside Book, both of which benefited from additional assistance by Jeremy Duns. 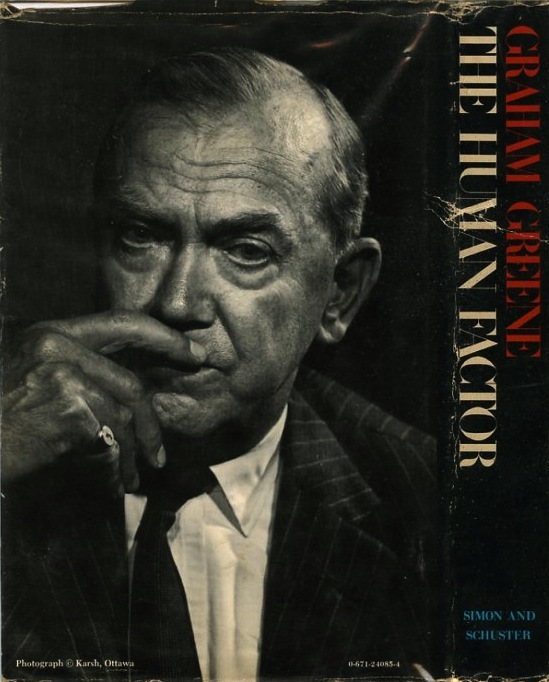 And it's to Graham Greene that we return for this finale – and indeed for the first of next week's posts, too; more on that later – with two editions of the same book. That's right: two editions. What fresh lunacy is this? Allow me to explain. So how come it's not a true first? Well, the reason is, prior to this printing of the book, there was an initial run of, it's estimated, around a thousand copies. 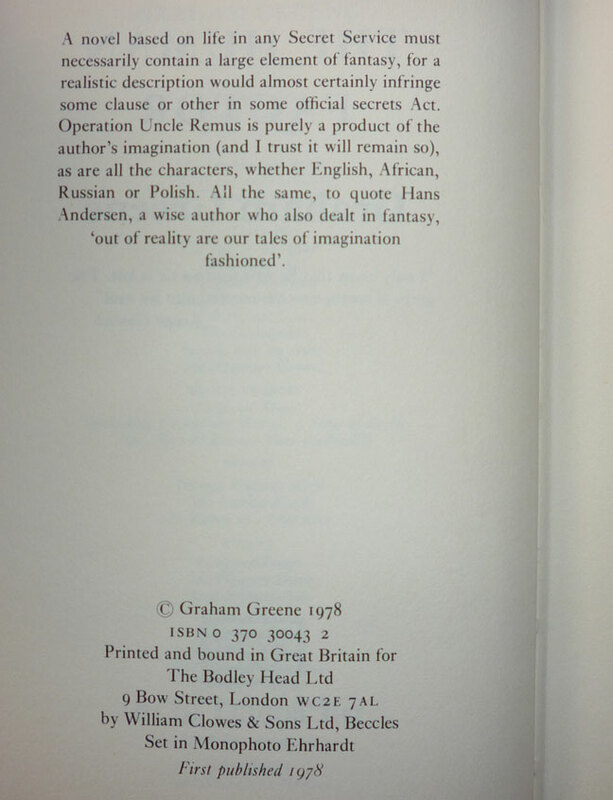 And those first printings bear one minor difference from the second printing: the publisher's logo on the title page. 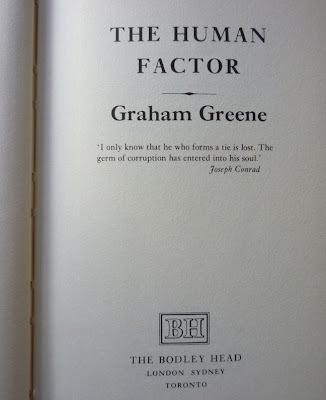 On copies of the first printing, the Bodley Head logo consists of an oval with Sir Thomas Bodley's head inside it; but on the second printing, that logo was replaced with a box with the letters "BH" inside it, apparently at the direction of Graham Greene himself. Ordinarily, discovering this would have been, for me, hugely annoying. An altered logo may seem only a minor thing, but to me, it makes all the difference as regards the desirability of a book. 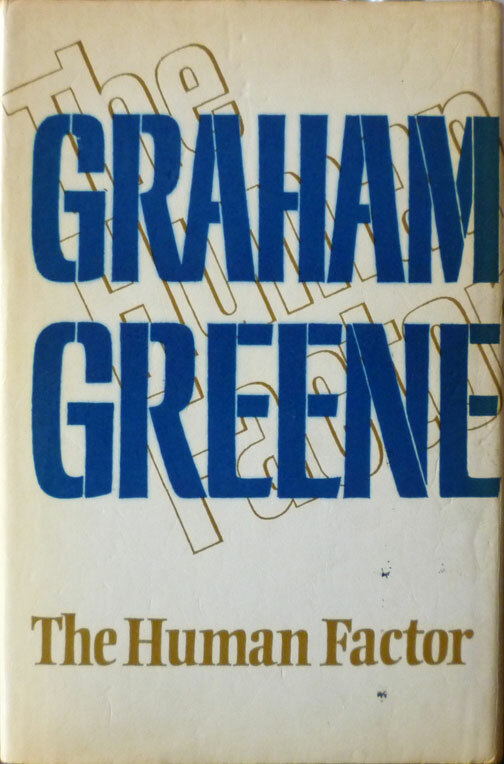 Realising that I own a second printing rather than a first would normally have set me off on fevered quest for a true first (of which there are a good number for sale online). But in this instance, it didn't, for three reasons. 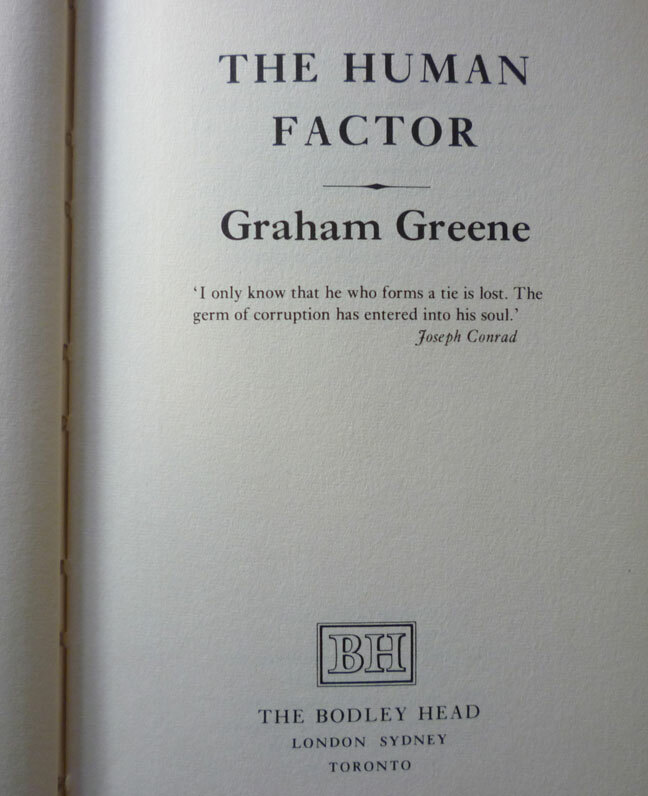 One, I paid so little for the book – six pounds – that it's really not a great loss – and anyway it's still a first edition. Secondly, despite the (very) occasional appearance to the contrary, I'm no expert on modern firsts (more of an enthusiastic amateur, really); part of the fun of collecting is increasing one's knowledge in a subject area, and looking at it philosophically we do, after all, learn by our mistakes. So, lesson learned. 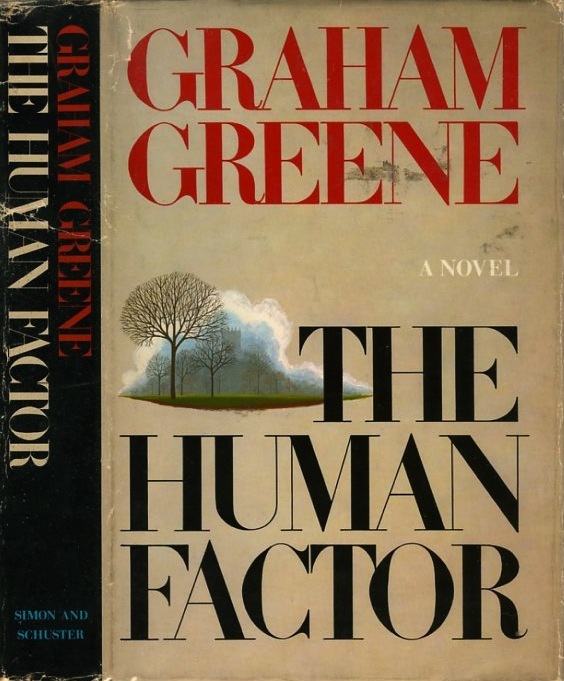 Anyway, The Human Factor is one of the few out-and-out pieces of spy fiction Graham Greene wrote. 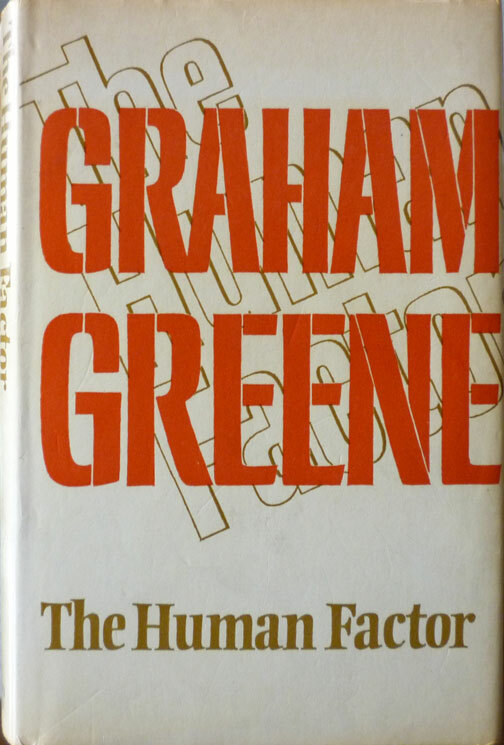 Many of his novels have espionage elements – the book I'll be blogging about next week, for one – but The Human Factor is about a leak in the Secret Intelligence Service and the subsequent marking for elimination of a junior operative. 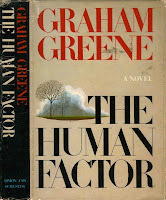 Greene actually began writing the book ten years before it saw publication, but abandoned it after a couple of years because of the Kim Philby affair, worried that it would be seen as a roman a clef. 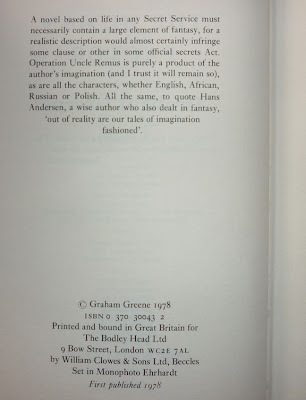 He even sent a copy to Philby, who by that time was ensconced in Moscow. There's more on Greene's take on the book here on the indispensable Greeneland website. Interesting. 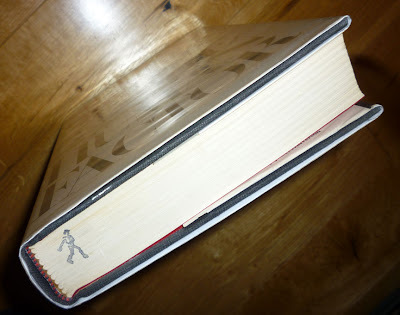 I've come across red dot remainder marks on US books before, but not a stamp. Ta for the info! now the book destroyers slash the top or bottoms of the books with a magic marker slash. Random House years ago also had their mark.